I almost typed The Vampire Diaries on the blog title, lol. I have been watching the series from the beginning in 2009 and I personally enjoy it. We love our Yumbox Panino leakproof lunchbox in which I have the confidence of sending yogurt, applesauce and dips with Nikolai without worry of them leaking and touching other foods. He likes the Chobani pumpkin spice Greek yogurt and I added a cute vampire cupcake ring on it. This vampire was fun to create although it's not as handsome as Damon (Ian Somerhalder) of The Vampire Diaries. ;) The face was made on a circular cut sandwich by cutting nori in part with circle cutter and part by freehand to shape for the identifying hair style, and the dark behind the candy eyes. The mouth was freehand cut from fruit leather with the vampire fangs made from provolone cheese. The Cape was also cut from nori. Center: Organic baby carrots cut into halves. Top right: Orange slices and kiwi slices. Bottom right: Chobani pumpkin spice Greek yogurt with a cupcake ring. 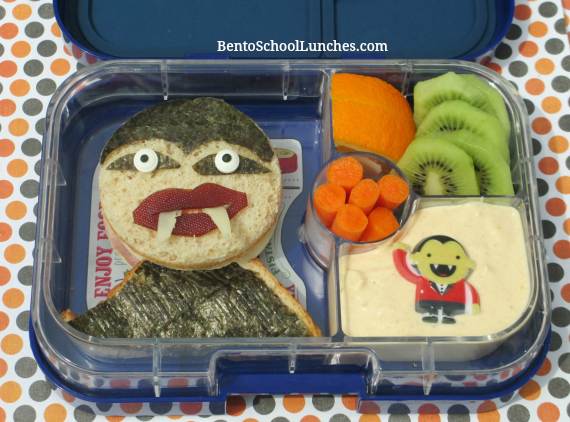 What a cool lunch! I've been thinking of getting the yumbox for my girls. Love how you made the vampire! So cool! Thank you Jean, I am glad to know that you love it!